Viera, FL– (July 22, 2018) The Pride are hosting one of the last home series of the 2018 season this week at the Space Coast Stadium! The Pride will take on the Cleveland Comets in a three-game series. The series will begin on July 23 and conclude Wednesday, July 25. The past week the Pride defeated the Beijing in a five-game series by a combined score of 37-1, to improve their overall record to 33-2, the second loss coming from the Spirit last weekend. 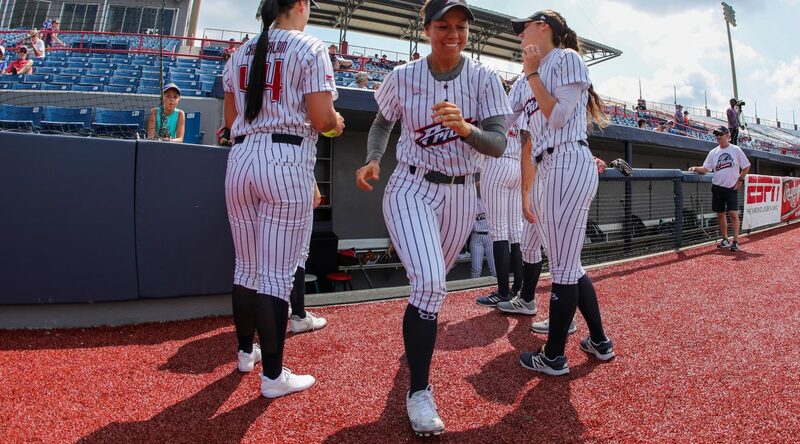 In the past 35 games, the Pride offense leads the NPF in RBIs– 26 by Sierra Romero. Megan Wiggins is second for homeruns – nine – in the league. The Pride have multiple players in the top-10 categories for offense. The Pride pitching staff has totaled an impressive 230 strikeouts with an 0.76 ERA, going down from a 0.83 ERA last series. Megan Wiggins: Wiggins is coming off a great series. Improving her batting average to .340, with a slugging percentage of .726. She improved her homeruns on the season to nine, which moved her up to second in the league. Wiggins is second in the league in runs with 29. Jolene Henderson: Henderson is currently 8-0 on the season. She has improved her ERA to a stellar 0.46, and now leads the league and the Pride. In 61 innings pitched, Henderson has only allowed 26 hits with 46 strikeouts, two shutouts, and multiple complete game wins. The Pride will take on the Chicago Bandit for the last home games of the 2018 in a three-game series, beginning on July 26 through July 28. Get your tickets at profastpitch.com today!